Jugnoo and Jassi: Microcore and Bicore based walking robots. Bhola Jr.: A bicore based light seeking head. The Photovore Family: A collection of 8 BEAM Bugs. Nathulal and Bhola : Nathulal is the walker while Bhola is a phototrophic head. Micromouse 2006: My first micromouse. 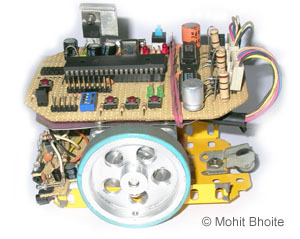 Basanti: An advanced line following robot using PIC 18F452. 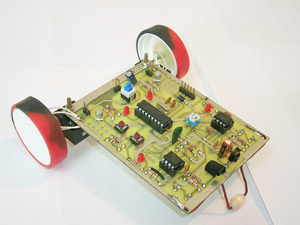 Dizzy: A PIC16F84A based line following robot.